Nailbiter, squeaker, whatever you want to call it. The Eastern Conference cut a 21 point deficit to one in the final minute. Dwyane Wade (triple-double) had a chance to send them ahead but fumbled a pass from teammate LeBron James. defeated and rejected as the buzzer sounded. After scoring at will to bring the East back, he made some bad decisions in crunch time. Kobe Bryant scored 27 points, moving past Michael Jordan as the career scoring leader in the All Star Game. The star of the night was Oklahoma City Thunder forward Kevin Durant. 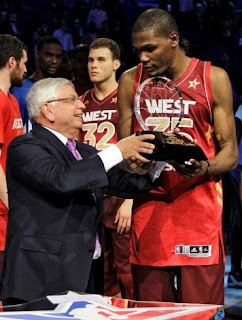 KD dropped 36 for the Western Conference and took home the MVP honors.